There’s still a lot of good in the world. That’s something I must remind myself about almost daily these days (I have a strong feeling I’m not alone!). So today we spotlight several coffee companies and coffee-themed organizations doing wonderful things for people in need around the globe. Grounds for Health was founded in 1996 by Dan Cox, the president of a U.S. coffee company, and his close friend Dr. Francis Fote, OB/GYN. It began when the two men, while visiting coffee cooperatives in Mexico, learned that cervical cancer rates there were some of the highest in the world. Working with a Mexican OB/GYN, they set out to improve cervical-cancer screening starting in the Oaxaca region. Their organization eventually expanded to become an internationally recognized 501(c)(3) non-profit, with programs in Latin America and Africa. To date, they’ve treated 6,729 women and screened 92,037 for cervical cancer, as well as trained more than 400 healthcare providers in clinical practices. 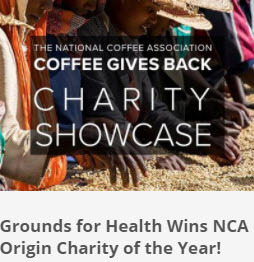 Grounds for Health has several coffee-company donors including Coffee Enterprises, Caribou Coffee, Dean’s Beans Organic Coffee, Keurig Green Mountain, Peet’s Coffee, Royal Coffee Inc., Swiss Water Decaffeinated Coffee, among many others. Well, I know whom I’ll buy my coffee from! Coffeed Roasters is a Queens-based coffee company with locations scattered throughout New York City (and one in Seoul, Korea!). Each of their coffee shops donates 3-10 percent of their gross revenue to a partnered charity. For example, the Long Island City store endorsed City Growers, which sells fresh produce to local communities, and its Port Washington, Long Island shop gives to Community Mainstreaming Associates, which helps people with developmental difficulties. Founder Frank Raffaele, a former aide to New York City Parks Department head Henry Stern and ex-trader on Wall Street for 12 years, insists this model of giving from each cup is a lucrative one. Altruistic, yes, but as a former Wall Street guy, he also covers his bottom line. “I believe one hundred per cent that making money and giving to charity or having a socially responsible business aren’t mutually exclusive,” he said. And it’s working: Coffeed Roasters has managed to donate more than a half-million dollars to charity since its founding in 2012 while it continues to expand. Located in Roswell, Georgia, Land of a Thousand Hills was established a decade ago to encourage healing in Rwanda in the aftermath of the country’s civil war and genocide. The company’s “Drink Coffee. Do Good” philosophy aims to foster economic sustainability within these African communities through direct trade with Rwandan farmers and then roasts them at its metro Atlanta location. The company also has locations in Virginia, Florida, Texas and Massachusetts. Additionally, Land of a Thousand Hills has partnered with a nonprofit called the Do Good Initiative, which strives to help Rwanda’s communities through various measures such as supporting single mothers, health initiatives for some of Africa’s secluded villages, and making sure communities have safe drinking water. Opened in 2015, this downtown Columbus, Ohio, coffee company provides “good through a cup” by covering three global issues: promoting clean water and fighting both hunger and human trafficking. The shop partners with about a dozen nonprofits based in Ohio and abroad to consistently support their initiatives. Of course coffee is the key component in this operation, so the Roosevelt Coffeehouse serves Columbus’s own One Line Coffee and Portland’s Stumptown Coffee Roasters’ coffee. Offerings include single-origin pour-overs, bottled cold brew, and other brewing options (think French press, V60, and Chemex). The bar top was fashioned from an old bowling-alley lane, with the arrows still visible in the wood grain. Owner and former youth pastor Kenny Sipes wanted to provide a “high-end” space as a backdrop to all the giving. Mission accomplished! Well, of course we’re not going to let you leave before we talk about our giving, too! Check out our colored-ribbon Kollars and Kaps, which support organizations such as the Susan Komen Foundation for breast cancer research and TESSA for victims of domestic violence, as well as for AIDS awareness. To date, the company has donated hundreds of Kup Kollar cup wraps to these organizations’ events, fundraisers, and staff. 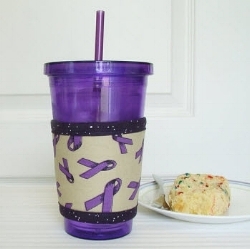 When customers who bought the coffee sleeves emailed asking for donations to use as gifts at private events and anniversary celebrations, we shipped the Kup Kollars immediately. Koffee Kompanions Founder and CEO, Irene Luckett, chose these organizations to match P&B Textiles’ fabric line, Ribbons of Social Concern. Irene says: “When I learned about this line, I knew it was perfect for our Kup Kollars, made with 3M™ Thinsulate™ insulation. 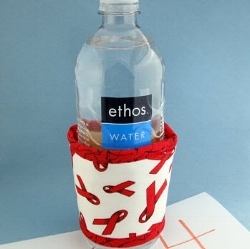 People who bought our cup wraps would be using them in public places, which would increase awareness of these important organizations.” Since then, she has added to the line two Kup Kap cup covers--for socially conscious coffee drinkers who want to keep their coffee hotter in cups and mugs. So, if you’re looking for a way to get involved in your community or others across the globe, these are some places you can go to enjoy coffee and coffee-related products while feeling good that you did! Read about additional U.S. coffee companies partnering with charities, and if you know of other coffee companies doing good in the world, please let us know in the comments!